Thanks to RayDean Shaw for sharing the photos on this page from the Dicy Feller Noel estate. Albert Nord was born near Cambridge, Henry County, Illinois in May 1859 to John and Catherine (or Carrie) Nord, both natives of Sweden. The 1880 Henry County census shows 21 year old Albert still living at home with his parents. On October 5, 1892, he married Mrs. Viola C. Pratt Dexter in Henry County. 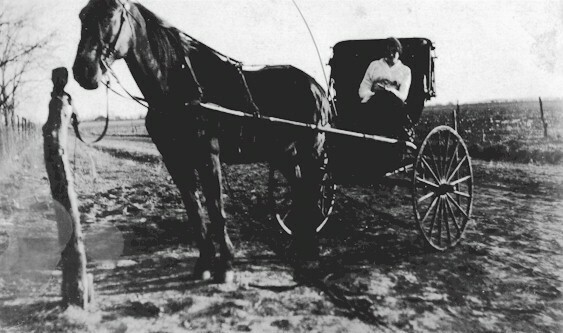 The Nord family lived a mile east and 1 1/2 mile north of Bronaugh. It was located in Prairie Flower district. Albert and Viola appear to have had two more children after Johnnie, Vivian Viola Nord in 1907 and infant Nord born in 1908. They are both buried in Worsley Cemetery, Bronaugh. 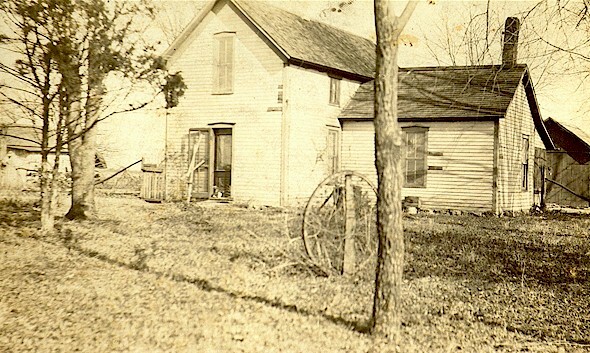 Since the family lived less than a mile north of Prairie Flower School, that is where the children attended. The children are in some of the Prairie Flower photos. Sale bill from the Bronaugh Journal. The following obituary appeared in the July 10, 1918 Bronaugh Journal. It tells of the death of Verona Nord of Cambridge, Henry County Illinois. She was a daughter of Mrs. Viola Nord and was buried at Rose Dale Cemetery. There is some confusion about the family starting at this point. 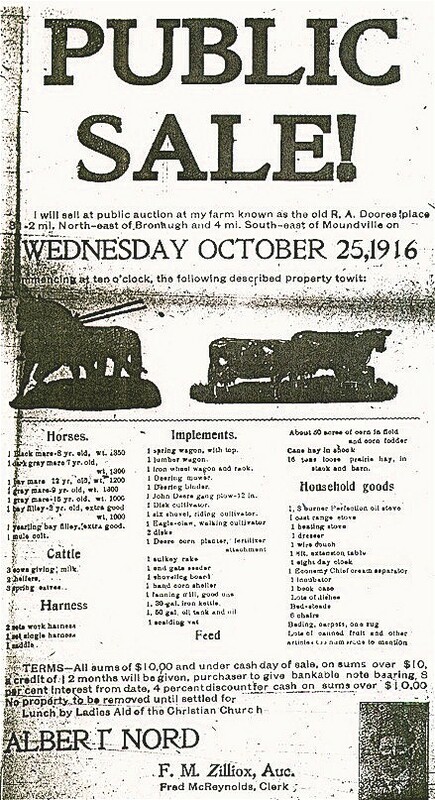 The sale bill to the left shows that Albert Nord was selling out in 1916. Then the obituary for daughter Verona Nord refers to her as a daughter of Mrs. Viola Nord (no mention of Albert). Also living with her was her daughter Grace Leonard and her two young children. Grace was age 29 and said to be a widow. The Mahan's lived in the house shown at the top of this page that had once been the home of Albert Nord. Albert D. Nord died June 17, 1931, and was buried in Worsley Cemetery next to the two infants who had been buried there in 1907 and 1908. Albert's wife, Viola, continued to live in Illinois and is buried there.